On Monday 16 April, we were visited by Li Changchun 李长春, Member of the Standing Committee of the Political Bureau of the Communist Party of China. I doubt if even the most assiduous British follower of current events had the slightest idea of who Mr Li was, but in China the news was big. The following day a report of the visit appeared on page 3 of The People’s Daily, and it even made the CCTV news – a friend in Nanking e-mailed me to say that he had seen me standing in the same room as Mr Li, and asked if I had actually spoken to him! 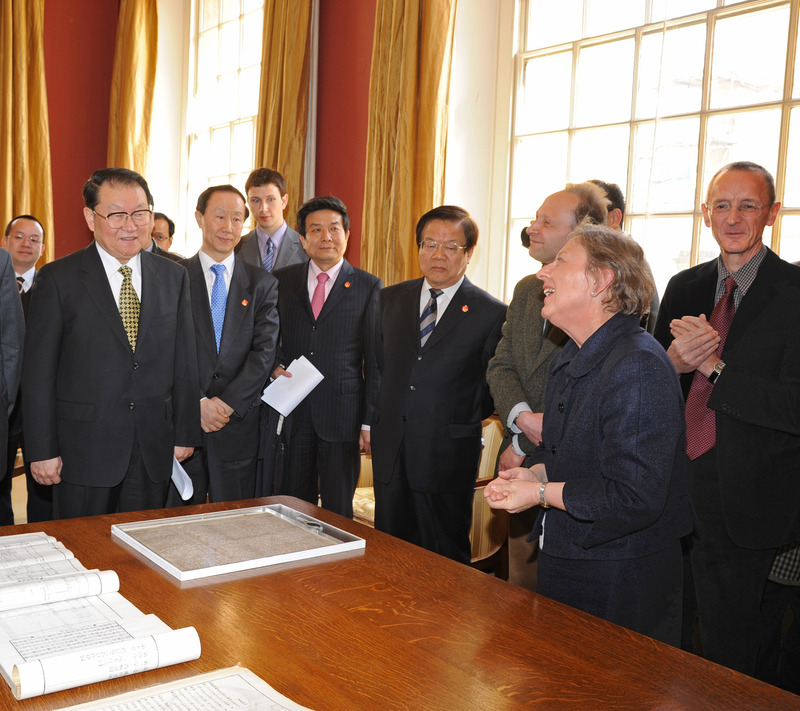 Mr Li is in the centre of the picture, with the Osney copy of Magna Carta in front of him. I can be seen on the extreme right wearing a tie that had been presented to me on my last visit to the National Library of China – I thought I might produce it on this occasion, as Zhou Heping 周和平, its current director, was also present. The work is a compilation based on works by three 19th-century French engineers, V Leblanc (c.1790-1846), Jacques-Eugène Armengaud (1810-1891), and his younger brother Charles (1813-1893). It was translated orally by John Fryer (傅蘭雅) and written out by his Chinese colleague Xu Jianyin, as detailed in the catalogue entry. For a long time I was puzzled by the attribution of the work to the Englishman Bai Ligai 白力蓋, whose identity I was quite unable to discover. Then, when preparing to write this blog entry, I revisited WorldCat and found that all the editions of The engineer and machinist’s drawing book (eight in total) had been published by the Glasgow firm Blackie and Son between 1855 and 1881. It therefore seems that “Bai Ligai” (or rather “Bailigai”) is not a person, but Blackie, the company that had organised the original translation and compilation from the French. I chose to show this work to Li Changchun because of the exceptional quality of its illustrations. 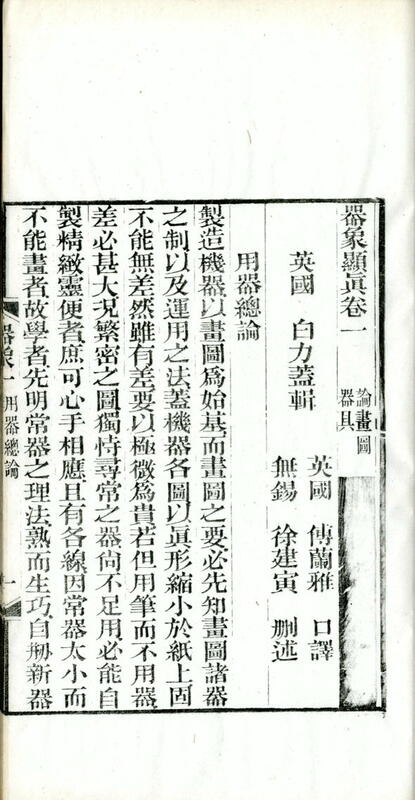 But it is actually one of many, printed in a uniform style and known collectively as Jiangnan zhizaoju yishu 江南製造局譯書, although this congshu title does not appear in any of the contents. Jiangnan Arsenal, Chinese (Pinyin) Jiangnan Binggongchang or (Wade-Giles romanization) Chiang-nan Ping-kung-ch’ang, also called Kiangnan Arsenal, in Shanghai, major Chinese centre during the 1860s and 1870s for the manufacture of modern arms and the study of Western technical literature and Western languages. It was opened in 1865 as part of China’s Self-Strengthening movement. 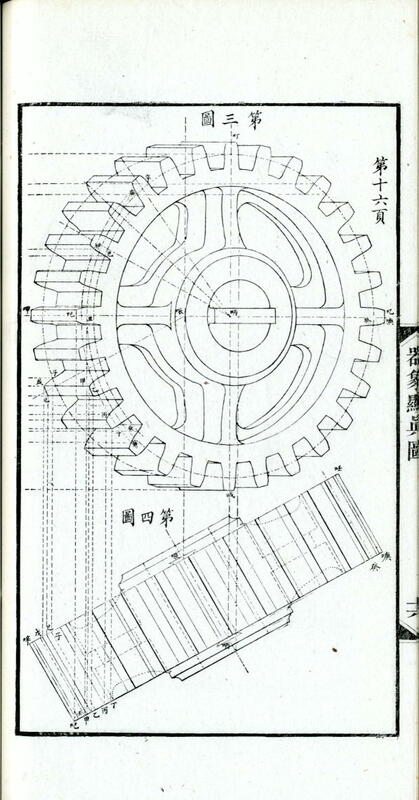 Begun as an ironworks base with machinery purchased from abroad, the arsenal was developed primarily by Zeng Guofan and Li Hongzhang. During the 1860s and 1870s it was the most successful arsenal in East Asia and one of the greatest in the world. Westerners were initially employed to instruct the Chinese labourers in the manufacture and use of the arms. In 1868 the Jiangnan Arsenal produced the first modern Chinese steamship. Its translation bureau, directed by the Englishman John Fryer, translated more than 160 foreign works into Chinese. The arsenal was managed by Chinese and staffed at one time by some 3,000 Chinese workmen, who were paid four to eight times better than the average farmer or coolie labourer. In the early 20th century it gradually declined in productivity, chiefly because of apathy and incompetent leadership. The shipbuilding department became an independent boatyard in 1905, and the arsenal—renamed Shanghai Arsenal—remained in operation until the early 1930s. This work, like the 67 examples of the Arsenal’s publications which the Bodleian holds, was exhibited at the International Health Exhibition in London in 1884, and bears the characteristic yellow exhibition label. Twenty-five years later, a lengthy account of the Arsenal (江南製造局記 十卷附錄一卷) was compiled by Wei Yungong 魏允恭, but the booklist (2:15-23) had grown to only 178 – the heyday of the translation bureau was the 1860s and 1870s. Original copies of this account, published in 1905 (清光緖31年), seem to be rather rare, but it has been reprinted a couple of times in recent decades. The most complete collection of Kiangnan Arsenal translations I know of is in Kyoto University’s Institute for Research in Humanities 京都大学人文科学研究所, which holds 154 titles grouped together in their catalogue as a congshu with the title 「江南製造局譯書彙刻」(see 京都大學人文科學研究所漢籍目錄, 上冊, 967-971).